For all the fishermen out there, keeping your fillet knife sharp is more of a necessity than a luxury. A sharper knife is much more efficient as it cuts through the fish faster with the most minimum effort. You must also be aware that it is quite dangerous to use a blunt knife. Such a knife requires you to apply more pressure and so can easily snap on your hands and end up hurting you. You can also miss your intended target and end up hurting yourself or your neighbor. Unfortunately, most people do not know how to go about sharpening their fillet knives with knife sharpener. For this reason, we are going to give you simple, tried and tested means of how you can sharpen your rapala fillet knife. First we will explore the basic principles in sharpening a knife. This is the raised piece of metal that forms when one edge rubs against the other. The formation of a blur is the first obvious sign that your knife is getting to the level of sharpness that you require. Note that the blur is not always visible but can be felt. To check for the burr, put your knife blade in a horizontal position and put your fingers at a slanted angle to the edge. Then, you should pull it gently down and away. The burr normally runs from the heel to the tip if the sharpening has been completely successful. Apart from the metallic surfaces which you rub your knives against to sharpen them, there are several other equally tough surfaces which you can rub your knives against. They include diamond stones, synthetic aluminum oxide stones, Japanese waterstones and Synthetic waterstones. You maintain the same angle throughout your sharpening session. It may sound easy but in practice, it is one of the most complicated things to do. You may find several hacks online as to how you can maintain the constant angle. You will probably get torn between having a coarse edge and a polished edge. If you use a finer piece of stone to sharpen your knife, chances are you will end up with a highly polished edge. Push cutting requires a finely polished edge as it involves cutting through fibers of food and pushing them to the side. Slicing, in contrast, breaks down the fibers, meaning that it requires the edges to be tougher. A polished edge has more durability and therefore saves you from constant maintenance costs. On the other hand, a coarse edge wears out at a higher rate and this means you will incur more maintenance costs. Let us now proceed to the main issue, and that is ways of sharpening a rapala fillet knife. This method would let you have control over the level of sharpness that you would like your rapala knife to get to. However, you will require a high level of skill in applying this method. You may end up getting your knife excessively sharp or you may just simply destroy your knife. The end result from using the sharpening stone depends on the angle you will use as well as the technique. Assume that you are slicing butter. Simply slide the cutting edge of the knife over the stone. Place the back end over the stone to facilitate easy sliding of the knife. This technique is really effective in making your knife sharp. You should be keen on the angle to also ensure that your fingers are safe as well. You will soon discover that this is the simplest method of them all. No effort whatsoever would be required from you as the machine would cover everything. In using this electric sharpener, there are two stages. The first one is the sharpening stage. You will be required to pull the knife through this stage several times until you get to the desired level of sharpness. The second stage is the honing stage and is meant to prevent the knife from becoming dull. In fact, you are advised to put your knife through this stage as much as possible after putting your knife to use for an extended period of time. In using this rod, you will follow the same principal as the sharpening stone. You will slide your knife over the rod and away from you for obvious reasons. It would take a real expert to slide the knife towards them without endangering themselves. Again, just like the sharpening stone, put special emphasis on the angle of sliding for more effective sharpening as well as your fingers’ well being. 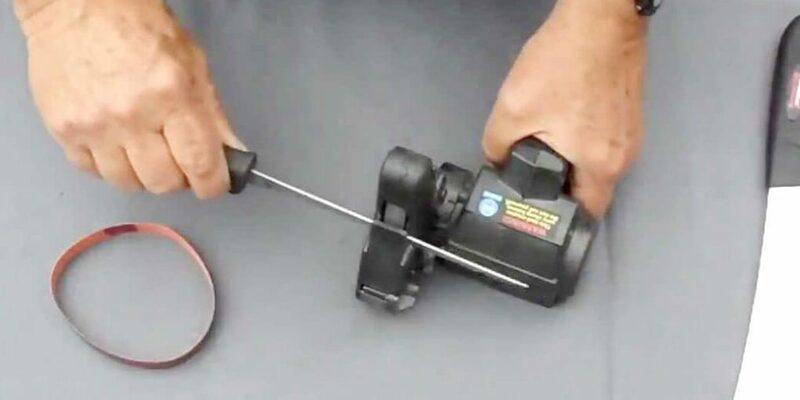 An alternative to a sharpening rod is a filling tool. This is a gadget which you can keep in your pocket like your pocket knife and you can pull it out whenever you need it. So, if your fillet knife is one that becomes blunt after just a few tasks, this tool might come in handy. This tool is mainly suited for use while in transit. For instance, it is quite convenient for the fishermen in the deep seas. In such a scenario, it is not really possible for the fisherman to rely on a sharpening stone or an electric sharpener, assuming the boat has no electricity. Apart from its convenience, this tool is also quite easy to use. All you would do is put your knife on a flat surface and ensure that the cutting side faces upwards. Then, take your accusharp tool and rest the v-shaped section on the knife. From here, just slide it over your knife repeatedly until you get your desired level of sharpness. There you have it. Sharpening your fillet knife is not as hard as you may have imagined. Just focus on the basics and everything else will fall into place. Keep in mind that practice makes perfect and so you should try out these methods repeatedly until you find the one which you are most comfortable with. When to Use and How to Choose the Best Fishing Shoes?